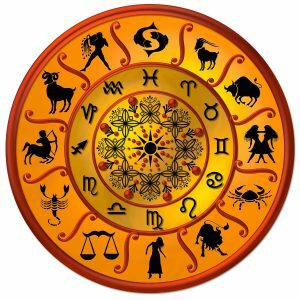 ARIES – Health related problems might cause discomfort. Use your innovative idea to make some extra money. For some- a new arrival in the family brings in moments for celebration and party. Plan something special for the evening and try to make it as romantic as possible. Playing video games in office might cost you too much today. Secret enemies will be eager to spread rumors about you. Your spouse will put efforts in making you happy today. 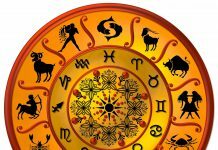 TAURUS – It is high time for you to realize that mental enemies lower the disease-resisting power of body therefore do not allow any unwanted thoughts in mind. Pending issues become murkier and expenses cloud your mind. You could be upset because of the prevailing conditions at home. Don’t waste your time in finding fault in your beloved. You will benefit from the changes occurring at work. Travel will be beneficial but expensive. Arguments, calling names, disagreements; these are the trouble of present-day married couples. You might become a victim today. GEMINI – It is a very auspicious day to get rid of drinking habit. You must understand that drinking wine is deadly enemy of health and it also retards your efficiency. Finances improve later in the day. Unexpected gifts and presents from relatives and friends. Leave dream worries and enjoy the company of your romantic partner. You might have a really challenging day at work. This will be an upsetting day if you jump to conclusions and take unnecessary actions. The day is exclusive in your regular married life, you will experience something really unusual today. CANCER – In spite of your high spirits you will be missing someone who couldn’t be with you today. Do not overspend on entertainment and luxuries. Gracefully accept the invitation- if you are invited to somewhere you haven’t been. Help someone to visualize himself succeeding in love. Things seem nice at work. Your mood will stay good throughout the day. Today is one of those days when things will not move the way you want. Today, you will realize that how does it feel to have a happy married life. LEO – Your jealous behavior may make you sad and depressed. But it is a self-inflicted injury so there is no need to lament about this. Motive yourself to get rid this by sharing other’s joy and unhappiness. Investment in stocks and mutual funds recommended for long-term gains. Spending time with children will be important. Don’t clamor loud about love affair. You might meet a wonderful person at work today. A sparkling laughter filled day when most things proceed-as you desire. Your spouse might deny to satisfy your needs today, which will eventually make you feel frustrated. VIRGO – You will have abundance of energy- but work pressure seems to get you irritated. Not a very beneficial day- so check your money situation and limit your expenses. News of family secret may surprise you. Your beloved will seem a bit irritated- which will add pressure on your mind. Your aptitude to learn new things would be remarkable. Rash driving and risk should not be taken while on the road. An old issue might crop up in between you two during a humorous discussion, which will eventually convert into an argument. LIBRA – Try to control your emotions especially anger. Use what you already have before rushing out to buy more. Sort out personal problems by understanding eachother’s point of view. Do not bring them in public otherwise chances of defaming you are high. Lovers will excessively be considerate of family feelings. It is also the good time to express yourself- and work on projects that are of creative nature. If you run from a situation- it will follow you in the worst possible way. Your parents might bless your spouse with something really wonderful today, which will eventually enhance your married life. SCORPIO – Drive with care especially if you happen to travel late night. Incase you are looking for ways to make little extra money- invest in secure financial schemes. A good day to revive old contacts and relations. Chances of facing agony of love on the cards today. Your working environment might change for good today. Be polite and charming to everyone whosoever stands in your way-Only a selected few will know the secret behind your magic charms. The day will provide you a respite after a difficult phase in married life. SAGITTARIUS – Avoid high calorie diet and stick to your exercise. Money position improves as delayed payments are recovered. Invitation in a award function of your child would be the source of happiness. You would likely to see your dream coming true as he lives upto your expectations. Being revengeful towards your lover will not bring any result-rather you should keep a cool head and explain your true feelings to your lover. You will benefit today if you listen to people with experience and try to apply new ideas in your work. Rash driving and risk should not be taken while on the road. Your spouse may disturb a plan or project of yours; don’t lose patience. CAPRICORN – Too much excitement and explosive passions could harm your nervous system. Control your emotions to avoid this. Finances will definitely get a boost- but at the same time expenditures too will be on the rise. You will upset your spouse if you spend money on things that you don’t immediately require. Control your passion it may put your love affair in jeopardy. Your haters might look more annoying to you today, which might increase your aggression. A sparkling laughter filled day when most things proceed-as you desire. You might feel lack of attention from your spouse, but at the end of the day you will realize that he/she was busy just for making the arrangements for you. AQUARIUS – Support of highly influential people will give a big boost to your moral. Surplus money should be invested in real estate. Older relatives are likely to make unreasonable demands. You will know today that the love of your partner is truly soulful for you. Playing video games in office might cost you too much today. A day for cautious moves- when your mind would be needed more than your heart. Rain is known for romance and you will feel the similar ecstasy with your life partner throughout the day. PISCES – Your rash behavior could cause some problem to a friend. Sudden unexpected expenses might exert financial pressure. You will feel disgusted today when you discover that someone you have always trusted is not very honest with you. Thoughts of meeting your friend after a long time may increase your heart beats like a rolling stone. Valuable support from a friend would help you in professional matters. Be careful not to make harsh comments in case you are pushed into an argument. You will cherish the old beautiful romantic days today again with your spouse.